LabourList is covering an interesting little story this weekend from Lancashire. 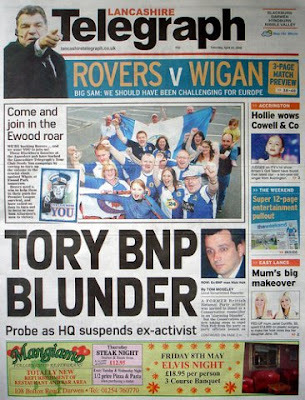 According to one local paper, the Conservative party inadvertently selected a notorious BNP activist to stand for a county council seat. "Nick Holt was head of the BNP in Blackburn, ran the local BNP office and stood against Jack Straw as the BNP candidate in the 2005 general election. He has also stood for the BNP and other extreme parties in every local election since 2004. He was recently approached by local Conservatives to stand in the upcoming local elections." It really makes you wonder what questions where asked at the selection meeting. And what the answers were that the local party liked! ?